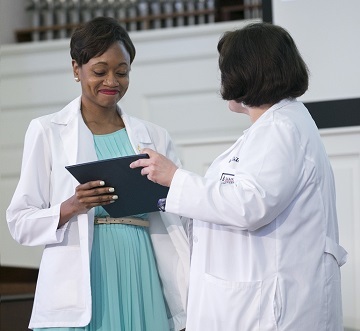 On Friday, April 22, 132 third year pharmacy students were honored at the annual Professional Pinning Ceremony in Samford’s Reid Chapel. The event recognizes students as they make the transition from the predominately classroom environment to advanced pharmacy practice experiences. DeAnn Mullins, president-elect of the National Community Pharmacists Association, provided the keynote address. The top performers in the Pharmacy Curriculum Outcomes Assessment were also recognized.